Consumers across America experience sticker shock with their monthly electrical bills. While kilowatt rates vary by vendor, a national increase is being seen across the country, year after year. With the enactment of the Clear Air Interstate Rule from the Environmental Protection Agency, 31 states are required to substantially reduce power-plant emissions. Specifically, power plants must reduce sulfur dioxide emissions by a whopping 71 percent and nitrogen oxide emissions by 52 percent. Coal is both the most common energy source and the primary cause of both emissions. As a result, this new regulation is expected to cost coal power plants billions of dollars for retrofitting or in facility replacements. Naturally, this expense is being passed on to consumers. Short of going “off the grid,” what’s a customer to do? When the weather hits over 90 degrees and it’s too hot to be outdoors, leave your credit card at home and head to an air-conditioned mall. After a few laps around the perimeter, you’ll have gotten some exercise while catching up on the latest fashions. Turn off the air conditioning, the TV and all those electricity hogs and enjoy some time in the great outdoors. If your kids spend their summer vacations playing video games, they’re sucking up a lot of energy without expending any of their own. Sign them up for sports leagues, summer camps and other activities outside the home. While you may have to pay a registration fee, you can still save on equipment by using Target and Sports Authority discount gift cards ordered from such sites as GiftCardGranny.com. Even if you’ve turned off the television, computer and other power vampires, those power strips are still sucking you dry. The same goes for rechargers, which may seem benign when not hooked up to your cell phone. The fact is, they’re still drawing electricity when not in use, so flip that switch. According to the Lawrence Berkeley National Laboratory, the standby power of unused appliances usually accounts for 5 percent to 10 percent of residential electricity costs. Running a computer and monitor 24/7 uses about 1,100 kilowatt hours annually, or roughly $100 a year. Save 60 percent to 80 percent by putting your computer in power-saving mode or turning it off completely. Use an old-fashioned can opener instead of that space-hogging electrical opener to reduce kilowatt usage. Clean rugs with a carpet sweeper instead of a vacuum. (You can find these old-fashioned cleaners at a surprising number of garage sales.) Dry laundry on a clothes line or rack instead of a power-hungry dryer. (Washers and dryers are 19 percent of your energy bill.) In general, consider how you can replace miniature power users with powerless appliances. Turn off or turn down an air conditioner by keeping windows covered during the day. You’ll minimize sun exposure while maximizing the cooler night air. It may seem hand-washing dishes would reduce both your water and electrical bill, but Energy Star appliances are actually much better for your family finances. The original investment, however, is terribly high. As a simple fix, wait until the dishwasher is completely full before running it. Avoid filling the machine with over-sized pots and pans as they’re cheaper to wash by hand. Keep in mind that dishwashers compose 2 percent of your electrical bill. You’ve heard lots of talk about CFL light bulbs and there’s a reason why. CFLs are cheaper to run, generate less heat and last much longer. 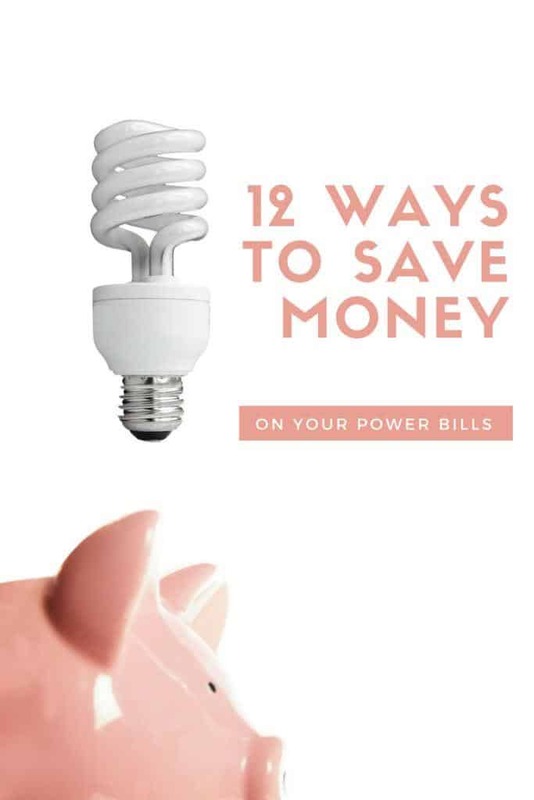 Switching out just one incandescent bulb for a CFL will save you $35 in energy costs — or up to 65 percent — over the projected 10-year life of the bulb. Pasta, veggies and other foods cooked in water will continue to cook once the water is boiled. Turn the burner off half way through the cooking process and you’ll reduce your energy use; just make sure you leave on the lid to hold in the heat. As with your dishwasher, these kitchen appliances operate more efficiently when full. You needn’t overbuy at the supermarket, however. Instead, fill bottles and milk containers with water to take up the extra space. Give your air conditioning system a break when no one is in the house. According to Energy Star, increasing a house’s temperature during these hours by pre-programming a thermostat cuts the average household’s electric bill by $180 a year. That’s because heating and cooling systems are 45 percent of your monthly energy bill. Filters clog up with pollen, animal hair, dust and other unmentionables. Cleaning or replacing your filter improves efficiency. You’ll want to clean it more often if you have pets or are experiencing a particularly heavy pollen season. This article was shared by Consumer Savings Expert, Andrea Woroch. She has been featured as a media expert source on NBC’s Today Show, FOX & Friends, MSNBC, ABC News NOW and many more. For more savings tips follow @AndreaWoroch. Those are some great tips! Especially the filter cleaning 🙂 I’d love for you to share over at Let’s Party! https://themarkandjanshow.com/2018/02/13/lets-party-8/ … we look forward to seeing you there!